I have a recurring dream. I’m at the Abattoir market. I’ve bought all I can carry and my wallet is empty. Then I see a bunch of voluptuous, sweet kakis, which I can now no longer afford. The vendor yells the above marketing catchphrase at me. I wake up crying. The Abattoir (French for ‘slaughterhouse’) in Anderlecht dates back to 1888. The site is a bit lugubrious: over 200,000 animals are slaughtered here on a yearly basis. But don’t let that kill the fun. 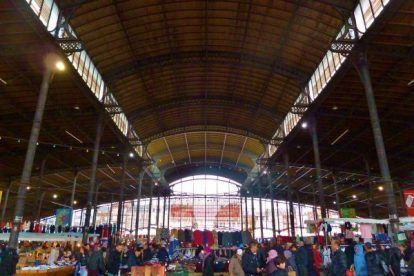 The Abattoir weekend market is a most impressing event, similar to the South Market (check the Gare du Midi Market article). But here you can admire the grand markethall’s magnificent industrial design. The market itself is huge and the new FOODMET opened up in May 2015. An anthology: you can buy fish and meat (fresh), shampoo (2-in-1 saves time), socks (I prefer white sport ones), plants and flowers (I collect cacti), rabbits (take two, one will get depressed), children’s toys (robots are cool), vegetables and fruit (I really like kakis a lot), birds in a cage (please don’t) or olives (taste first, then choose). Prices are a lot cheaper than in supermarkets. You’ll purchase less useless wrapping (Abattoir forbids plastic bags). Towards the end, you can make good deals because vendors want to get rid of their fruits and vegetables! But make sure you always have emergency spare change, in case you come across a case of your favorite fruit.